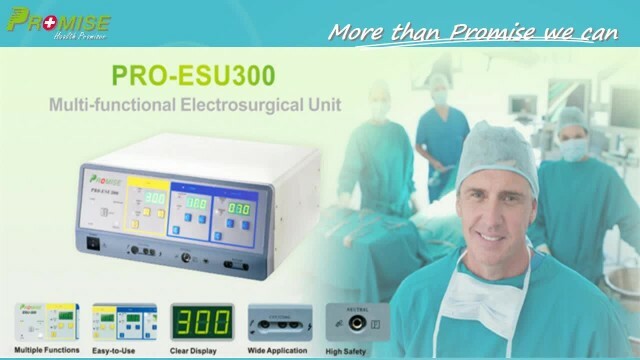 300 Watt Diathermy Machine -- Jo Zhou video from PRCMISE TECHNOLOGY CO., LTD.
High-frequency Electrosurgical Unit is an advanced electro surgery equipment for incision and coagulation of the biological tissue through the high frequency current. It is an excellent substitute for mechanical scalpels due to its simple & safe operation, fast tissue incision and blood coagulation. It is wide use in General surgery, Gynecology, Urology, Oncology, Orthopedics etc. 02:17 Promise Technology Co., Ltd. Showroom -- Jo Zhou PRCMISE TECHNOLOGY CO., LTD.